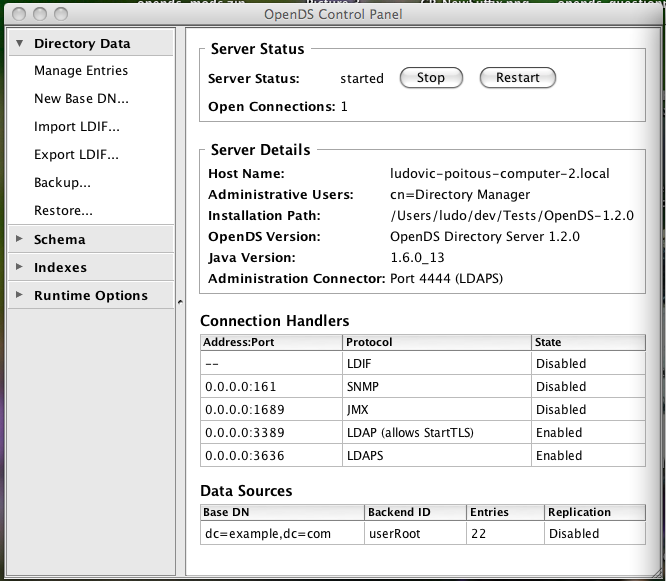 OpenDS 2.0 has just been released and there are several new and exciting features in it. 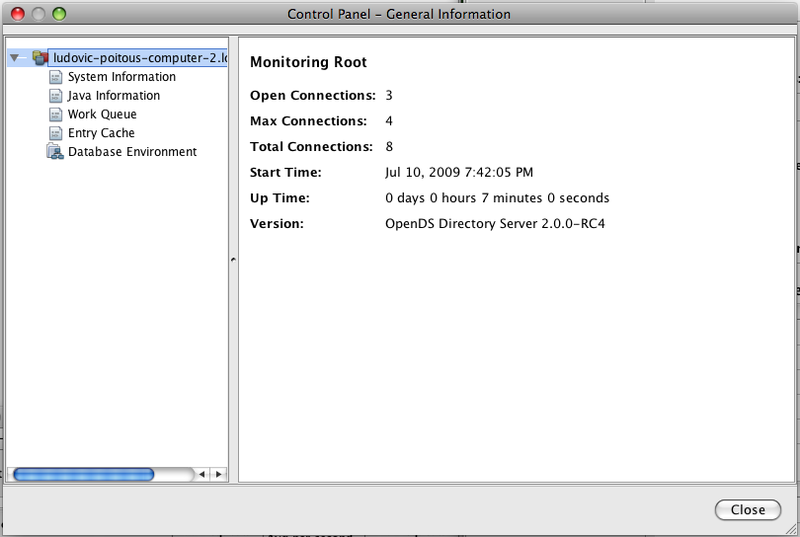 Today we will look at the new feature in the Control Panel: the monitoring aspect. At first look when we compare the Control Panel for OpenDS 1.2 (on the left below) and the one for OpenDS 2.0 (on the right below), not much has changed. Except for the left bar menu that contains a new section: Monitoring and a status bar at the bottom of the panel. 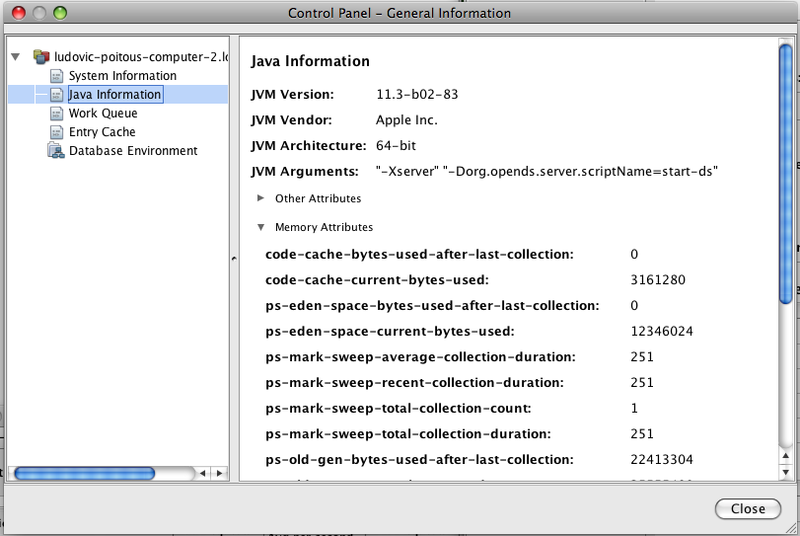 In the General Information Panel, you will find overall statistics such Connections, Up Time, but also information related to the system like the name, OS, number of CPUs, available memory in the JVM. You will also have a screen dedicated to the Java VM specific information (see below) such as the version, the vendor, the running arguments, a lot of details about the various segments of memory of the VM. A third screen highlights the work load. The fourth one gives details about the entry cache and the fifth one gives details about the local backend database environment, i.e. low level statistics on memory, transactions, locks in the database. There are more than 50 parameters from the database that you can retrieve and look at with the “Show Operations…” button. 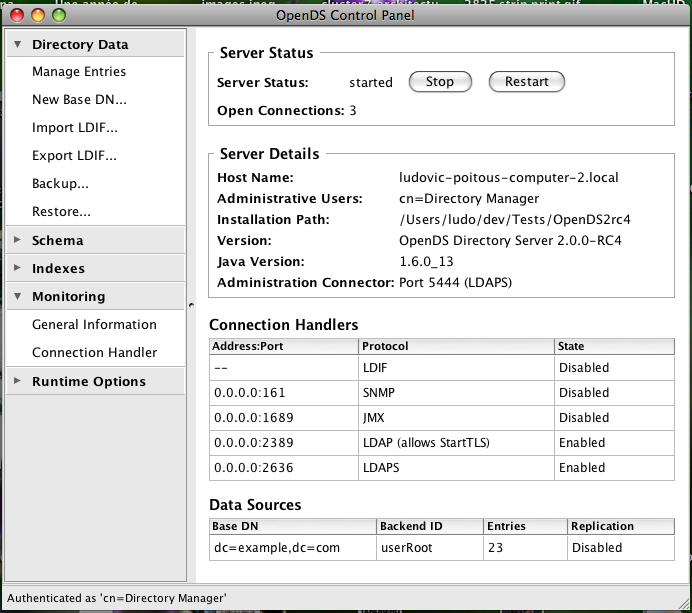 The Monitoring Panel for the Connection Handler gives greater details about the LDAP operations that are processed by the server, sorted by kind of Connection: what goes on the LDAP port, what happens on the LDAPS port and the Administrative operations. There are many more statistics information available from the OpenDS server, either through LDAP, JMX or SNMP if you have enabled the later two. Not everything can be displayed in the GUI, and in future version we will provide external tools or widget to graph some of the monitoring information. Meanwhile, play with the Monitoring screens of the OpenDS 2.0 Control Panel, and let us know what you think, what you like, what you feel is missing. [Trackback] Read their highlights, complete with configuration steps and other nuances, thanks to Ludo Poitou.